If you don’t already know, wall mounted fires are exactly what they sound like. They are fires which sit on a bracket mounted to your wall. They are slightly different to inset or hole in the wall fires as they don’t sit flush against the wall in a recess. Instead, they will protrude out slightly as they sit against the wall. In this guide, we give you everything you need to know about what type of wall mounted fireplaces we have available, how to install them and which ones are best. Just before we get started on your options, we thought we’d answer one of the most frequently asked questions. How high should a wall mounted fire be? You can fit your fire anywhere on your wall so long as it meets any installation requirements. Many people like to have them at eye level from a seated position, which works out about 40-42” off the floor. Others like to place them between their wall mounted TV and the floor. If you want to do this, check the heat won’t cause your TV any damage first. The rest of the installation depends on what type of fire you have. 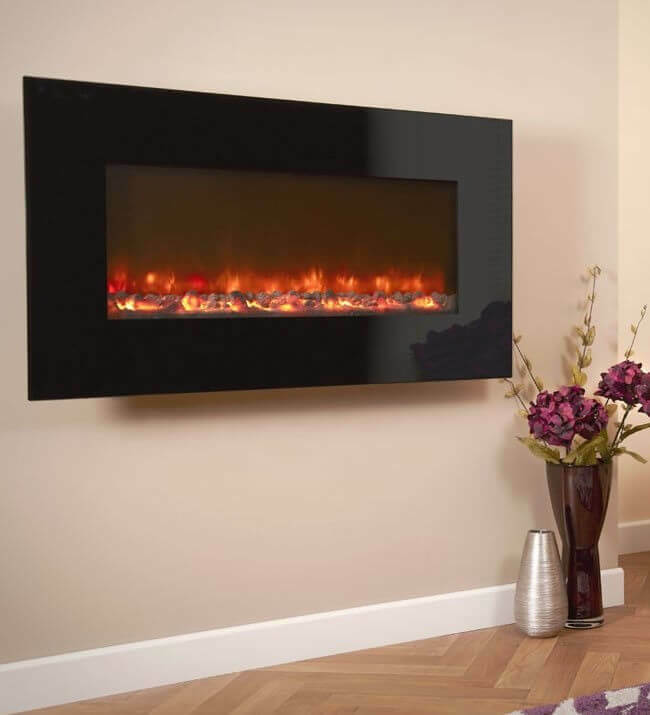 Read on to find out more about gas and electric wall mounted fires. If you don’t have a chimney, but want an impressive looking fireplace with minimal effort, this could be a great choice for you. Wall mounted electric fires are relatively straightforward to install and don’t require the same level of maintenance as a gas fire. Gas fires, as you will probably know, need annual checks to ensure you aren’t at risk of a carbon monoxide leak. Electric fires, meanwhile, run off the cleanest and most efficient fuel type. You can find out more about the pros and cons of electric and gas fires here. 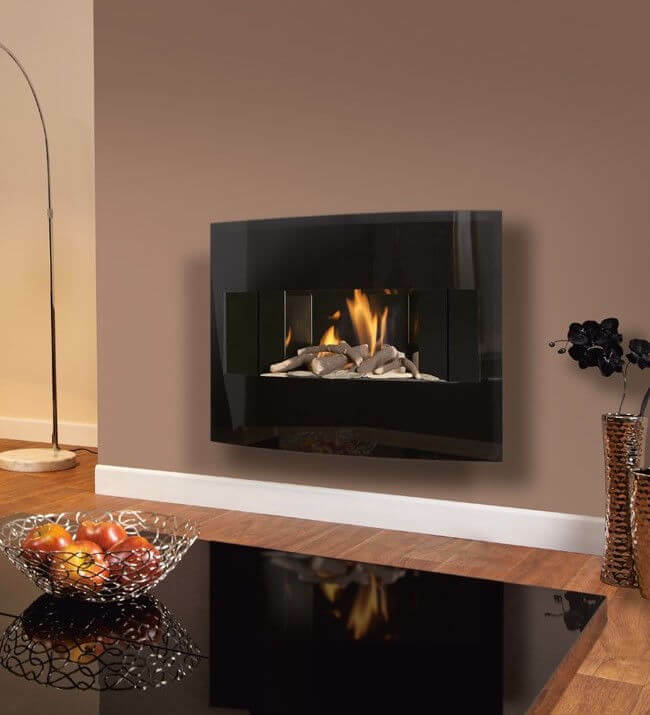 The main advantage of electric wall mounted fires is that they are easy to install and remove. If you move home, you can remove it and take it with you fairly easily. You will need to carry out some minor drilling to attach the bracket or hanging screws to your wall. If you have a chimney breast, you might wish to hide the wire by knocking a couple of small holes into the wall – one by your socket and one by the power outlet on your fire. Alternatively, you could neatly tack the wire to the wall and run it along your skirting board to your power socket. A little paint or a tactically placed table or accessory can also help you disguise a cable. You can find out more in our guide on how to install an electric fire. If you want to install a standard wall mounted gas fire, you will need a chimney. Unlike an electric wall mounted fire, you will probably need to have some building work carried out, too. You will also have to find a qualified gas fire installer to fit it for you who is on the Gas Safe Register. Before you fit your gas wall mounted fire, the usual advice applies of making sure your chimney is safe, first. It may be necessary for you to fit a chimney liner if there is a possibility that carbon monoxide could leak through. Unlike a hole in the wall gas fire, a wall mounted gas fire doesn’t need a recess to fit into. This means that if you don’t have a deep chimney or wall cavity, you can achieve a similar look, without the same building requirements. If you don’t like the lack of real flames from an electric fire, gas might be better for you! If you are interested, you can find out more about installing hole in the wall gas fires here. Our wall mounted gas fires are all glass fronted, which means they are one of the most efficient fire options around. Gas is also cheaper to use than electricity, so while electric fires are cheaper to buy and install, you might find it costs more to run. To find out which is best for you, consider how much you are going to use it and if it is worth the initial set up cost. 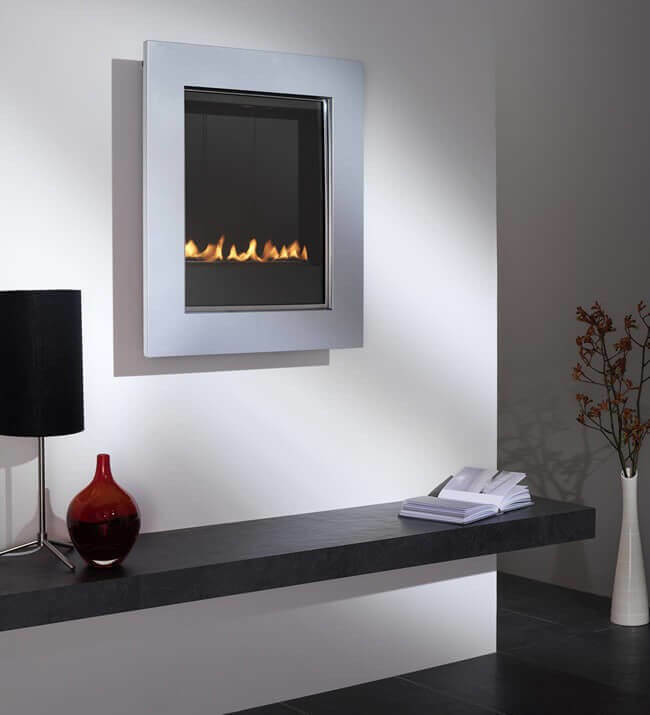 A wall mounted flueless gas fire could be the best of both worlds. Like an electric wall mounted fire, they don’t require a chimney. However, like a standard gas fire, they do still require some building work. But, they also offer that real flame that an electric fire lacks. 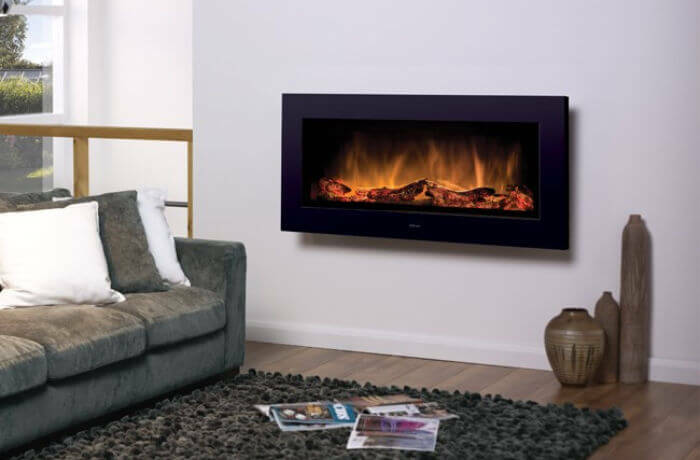 Like their name suggests, your flueless gas fire wont need to be attached to a flue or chimney. It will, however, still need to be connected to your mains gas supply by a Gas Safe Engineer. They are ideal if you want to enjoy the many benefits of a gas fire but don’t want to have to carry out heavy building work. One of the other benefits of choosing a wall mounted flueless fire is that they are 100% efficient! This is because no heat is lost out of a chimney or flue. Flueless gas fires work by using a catalytic converter to clean the fumes before releasing them back into the room. This is perfectly safe, though you do need to ensure your room is at least 30 cubic metres and you fit 100m2 ventilation brick. Of course, it will need a safety check every year, too. You can find out more about how to have a gas fire without a chimney here. Want to find out more about our range of wall mounted fires? Contact us today to talk to our expert sales team. 8 Advantages of Buying at Electric Fire | How to Choose the Right Electric Fire | Should You Convert Your Open Fire into a Gas Fire? Previous ArticleShould You Convert Your Open Fire into a Gas Fire?